It all started when politicians and out-spoken celebrities and sports figures started being exposed for the stinkers they are. It all started with a science grant that created a hypcrisy scanner. Tested on terrorists, it made them disappear. Tested on only the "sometimes" hypocritical, it made them evacuate their bowels. (To say it nicely.) As the effect on military higher-ups was also disastrous, certain conctractors got their research finances cancelled - so they took the circuit and made it a free download as a "gag" gift. Small enough to put in pens and give it away - or send to someone as a "gift." The results changed Washington and sports teams. But only those who were hypocritical. Integrity got new respect. See how it happened.... Excerpt: ...The funny thing was that there wasn't any noise, really. Just a sort of soft pop as the hypocrite disappeared. And it didn't get them all, just the worst two-faced and resolute propagandists out there. The people who were mostly, but not always, hypocritical just got very ill and tended to both throw up and empty their bowels at the same time. Very smelly scene. Once some of these got delivered to a government building for inspection. The results were quite interesting. Because they were in an always-on state. The battery just held the charge that the circuitry was always generating. With a fully charged unit, the chronic hypocrite would disappear. With no battery, handling the device would make them immediately foul themselves. Needless to say, there were quite a few soiled officials before they found out what was causing the disruption. Of course, they were soon labeled dangerous ordinances, and had to be packed in enormous boxes to keep people (meaning: long-time and high-ranking officials) from getting close enough to be affected. Unfortunately for them, we now get to the part of the viral effect. When some contractors found out what was happening to their higher-ups, particularly those who had disapproved their financing, the circuitry found its way into various gifts, such as flashlights, electronic picture frames, and even electric staplers. Once these were turned on, they could make fatal disappearances, but just delivered in an unplugged state to offices would make several people nauseous as they handled them. It wasn't long before the circuit was out on the Internet as a gag toy. Integrated circuits were printed about the size of a tiny battery, with self-adhesive. It didn't have to be hard-wired into the machine, but could be simply pasted inside the battery cover or any inconspicuous spot on or in it. Toy bears with electronic pull-string circuits became poo-poo gifts. Several versions of "honesty" testers were developed, all powered by the people themselves and "no batteries required." Someone funded a program to get wooden pens gifted to every member of Congress and all their staffs. A month's supply of toilet paper ran out in a week. .... And a religious TV interviewer found out that his button would affect his guests in different ways. He found that asking the person if they had ever taken money to throw a game, there wasn't any reaction. The circuitry wouldn't work on a bald-faced lie. But by asking pointed questions, such as "What they felt about people taking money to throw games?" That would get them leaving the interview quickly, and for obvious reasons. He later found out that he could root out sexual predators by asking how they thought people who sexually harassed others should be treated... Scroll Up and Get Your Copy Now. 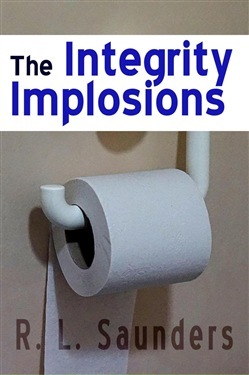 Acquista The Integrity Implosions in Epub: dopo aver letto l’ebook The Integrity Implosions di R. L. Saunders ti invitiamo a lasciarci una Recensione qui sotto: sarà utile agli utenti che non abbiano ancora letto questo libro e che vogliano avere delle opinioni altrui. L’opinione su di un libro è molto soggettiva e per questo leggere eventuali recensioni negative non ci dovrà frenare dall’acquisto, anzi dovrà spingerci ad acquistare il libro in fretta per poter dire la nostra ed eventualmente smentire quanto commentato da altri, contribuendo ad arricchire più possibile i commenti e dare sempre più spunti di confronto al pubblico online.